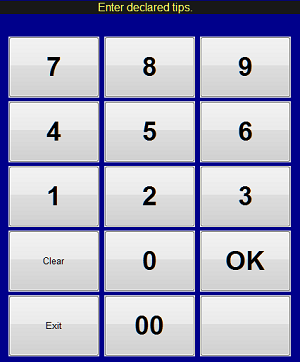 Time and Attendance is included with Execu/Touch POS and may be purchased as an add-on for Execu/Suite PMS. Several things have to be set up to use Time & Attendance. For POS, to go POS Administrator. In the POS Store Record, answer "Y" top "Timekeeping Setup". Enter the numeric pay period beginning day. Sunday is 1; Saturday is 7. The clock-in and clock-out grace period applies only if you are using Employee Scheduling. "Calculate daily overtime?" should be Y if you are required to record more than 8 hours in a day as over as overtime. Weekly overtime is 40 hours and cannot be changed. Next, set up work codes. 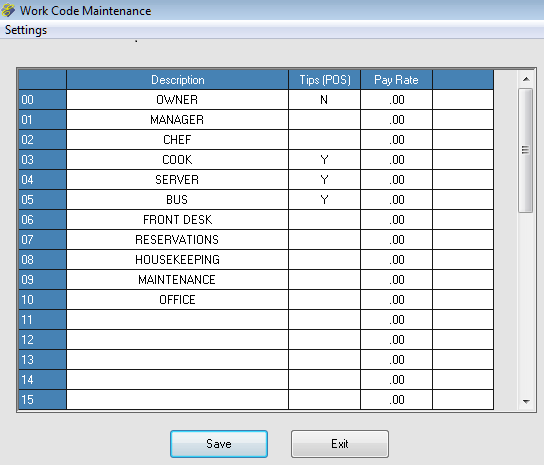 You can access this screen from the POS Administrator menu or from the Time & Attendance menu. Give each work code a description as shown above. If you want this employee type to declare tips at clock-out, type "Y" in the "Tips (POS)" column. You can enter the pay rate for this work code, or you can enter the pay rate for each employee in the Employee Setup or you can leave this field blank. Is you are integrating Time & Attendance to the Execu/Tech payroll system, this will override the Payroll rate setup for any imported hours. Click "Settings" at the top left "Work Code Maintenance" window. If you set this up in the POS store record, you do not need to set it up again. For PMS users not using POS, you should enter the information. To set up departments, go to System Maintenance (in the PMS master menu) or System Administrator (in the POS master menu). Select "User ID/Security Setup" then "Setup Department Records. Typically, labor departments are broader than work codes which typically are more specifically. For example, a department might be "hotel" with work codes for reservationists, auditors, etc. Another department might be "restaurant" with work codes for chef, server, cashier. The next thing you will do is set up the employees. Below is the employee setup screen for POS. If you have PMS and POS you can use either one for non-users such as maintenance. Other users will be set up in the module that they would normally log in - PMS for PMS users, POS for POS users. The POS Employee setup screen is in POS Administrator. Complete setup instructions are in POS Employee Records. 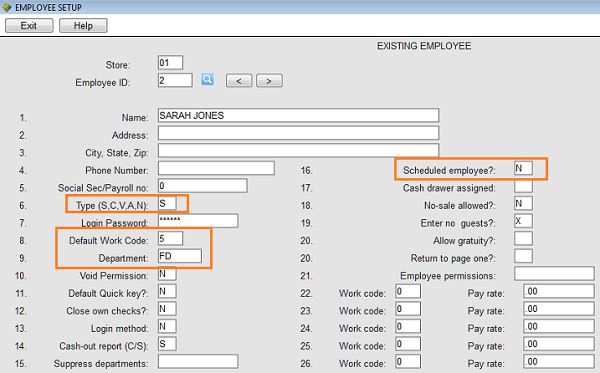 The fields (other than Employee ID and password) related to for Time & Attendance are highlighted in the above image. If you will use employee cards, see Use Employee Login Cards. Field 6: Type. POS users should be set to the type of permissions they are allowed within POS, as described in POS Employee Records. Users who are to clock in only, with no other permissions, should be type "N". In Field 8 enter the default work code for this employee. You may add additional work codes in fields 22 through 26. If you are using the payroll import, you can enter pay rates for each work code. There is a MENUINI configuration setting to NOT prompt for work code; the employee will be clocked in for the default work code only. You may also enter a labor department in Field 9 but this is not required. In Field 16, Enter N if the employee is required to clock in. 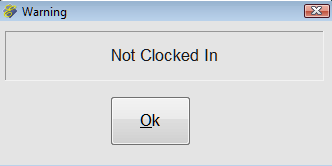 If clock-in is not required for this employee, enter X. Below is the employee setup for hotel (PMS) users. This is in System Maintenance - User ID/Security Setup - Employee Records. This also can be accessed from the POS System Administrator menu. 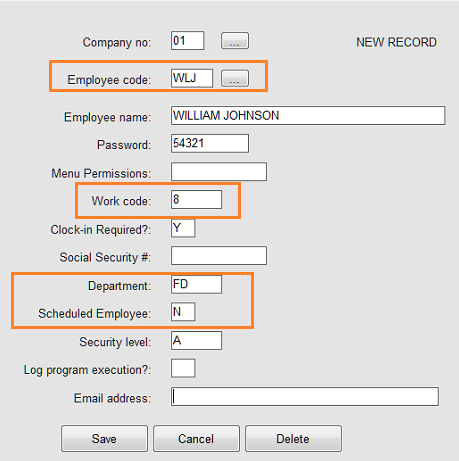 When using Time & Attendance the user ID must be three characters or fewer. Enter the work code and department code. For "Schedule employee" enter N. See the complete PMS employee setup guide. There is a setting to require supervisor password for clock-ins / clock-outs. By default his setting is disabled unless changed. There are several ways to access the clock-in screen, depending configuration settings and which screen you access when you log into Execu/Tech software. 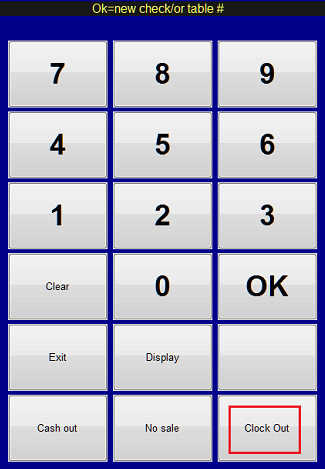 From the POS login screen, enter your password or swipe your employee card. From the PMS screen enter your ID, and password. If using an employee card, swipe when you are in the password field. To get to the PMS login prompt, you can go to File then Log In. From the PMS toolbar you can select the time Clock icon. Enter your password or swipe your card. If you do not have the File menu or the toolbar, you can go to the Time and Attendance menu and select Clock in/ Clock out. When you log onto POS or PMS a popup will let you know you are not clocked in. This does not pop up for employees not required to clock in. At the prompt enter your work code. Your default work code will display. 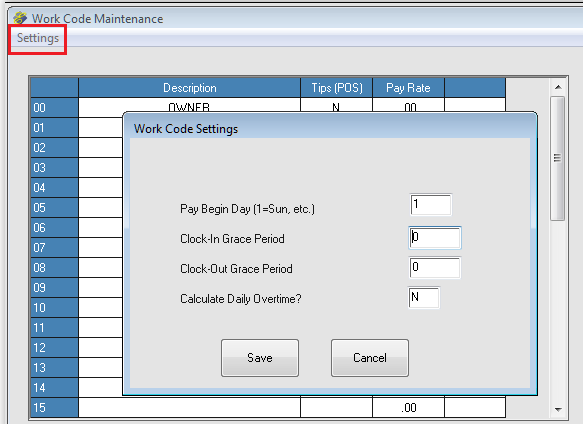 You can select OK or enter a new work code and then select OK.
A popup will verify that you clocked in. Depending on your settings, a clock-in report may print. How you access Clock-out depends on your configuration settings and whether you use POS or PMS. From the retail screen, select "clock out" on the keyboard that displays over the item entry screen. 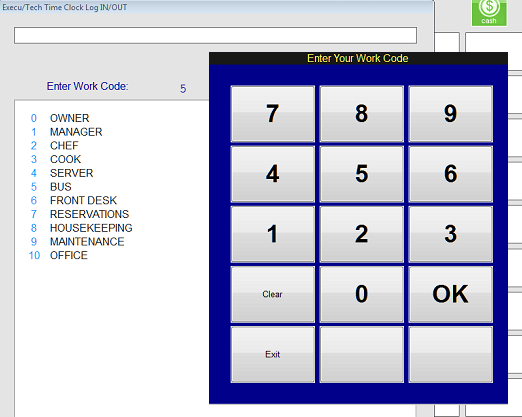 From the food & beverage table selection screen select "clock out". 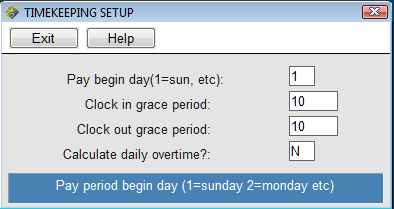 From the PMS toolbar select "time clock"
From the Time and Attendance menu select "clock in/ clock out". After you've clocked out a popup will prompt for declared tips if you are set up to enter them. Enter the amount with no decimal;. Type 1000 for $10.00. A popup will verify that you are clocked out. Depending on your settings a timeclock report may print. You can use the "Edit Tine Cards" function to make corrections, clock out an employee who forgot to do so, to enter hours for an employee, and to enter declared tips. You can get to this from the POS Supervisor menu or from the Execu Suite PMS Time & Attendance menu or the POS Master Menu. Enter the company/store number, User ID code, and date to edit. Then enter the time in the HHMM format followed by A or P such as 600A or 1230P. Make sure your caps is on. Enter the work code for those hours. You can enter as many lines as appropriate for this employee for this date. Enter Declared tips if appropriate. Use a decimal if entering tips. For example, type 15.90 for $15.90. When everything is correct select "Save/Next". The next date will display allowing you to enter or edit hours for that date. To edit a different employee, use the up-arrow on our keyboard. When you are finished select "Save/Next" and then "Exit". 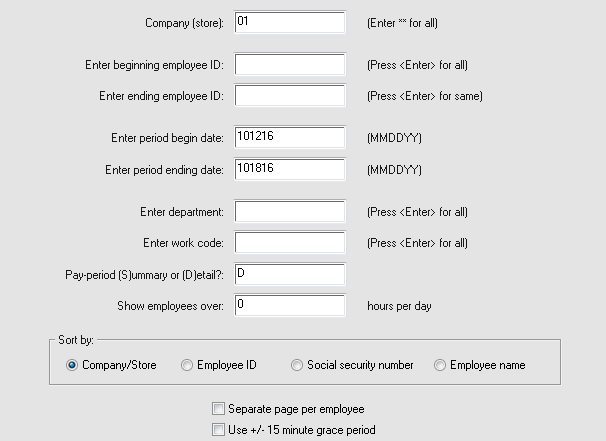 In the Time and Attendance menu select "Employee time clock report". Enter the appropriate information and click the appropriate "sort by" selections. This report will go to your default or selected printer. To print to screen (preview), prior to printing this report go to File - Select Printer - "review/Print to your screen". 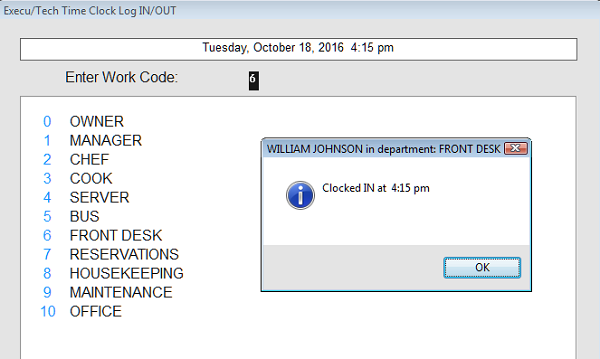 If you do not have a "file" menu, you can find "select printer" on your Time & Attendance menu or your POS Administrator master menu. 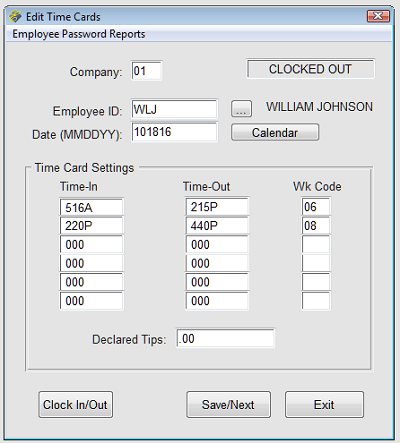 Print the employee time clock report. Then make sure you have cleared the last period in payroll. Then in the Payroll menu select "import time" or "import hours". The hours and work codes will import for each employee. If pay rates were defined for the employees' work codes, the hours will import at those rates, overriding the rates entered into the Payroll employee setup.